This special edition gold plated NeoMagnetic Cube was custom made just for us, you won’t find better quality anywhere else. If you’re looking for a high end Magnetic Cube this is the one you need. This gold NeoMagnetic Cube comes in a sturdy metal gift box featuring a display window. The box feels heavy and solid, as soon as you hold it you feel that you are holding a quality product. 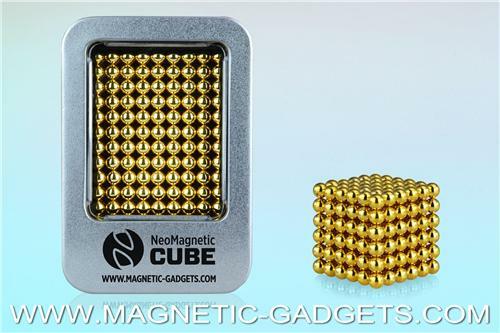 Made of 216 high strength, high quality Neodymium magnetic balls this NeoMagnetic Cube will keep you entertained for hours. Coating: High quality triple coating (Nickel, Copper, Gold) offers the best protection available against chipping and corrosion.